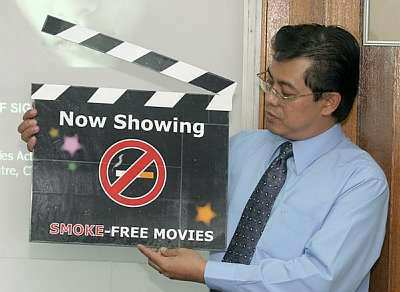 On February 22, 2005, groups around the U.S. and world -- from Argentina to India, New Zealand to Senegal -- participated in the first International Day of Action for smokefree movies. 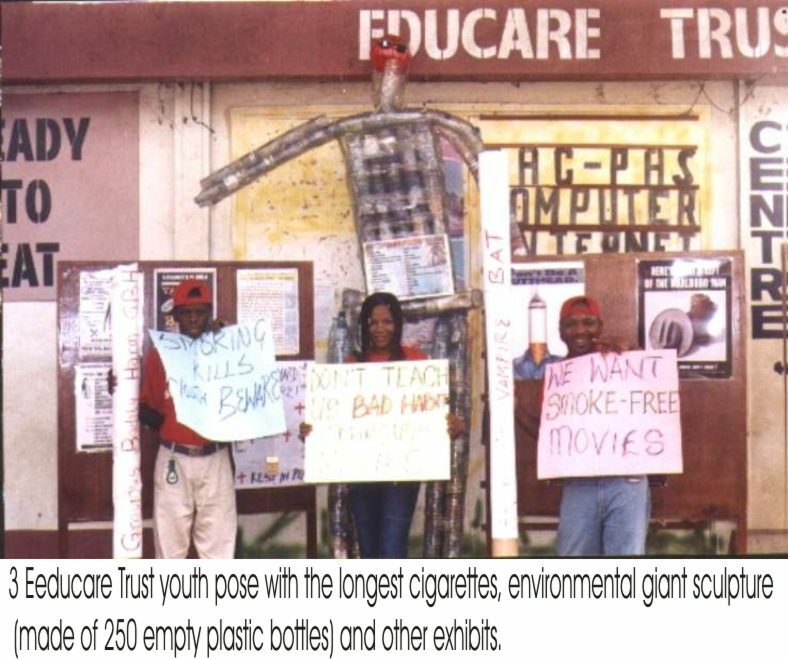 Activities included film screenings, press conferences, letter campaigns, exhibits, discussions, and demonstrations. While the focus of the day was on Hollywood, many groups used the opportunity to put pressure on the movie industries in their own countries, e.g. India, Nigeria, Sri Lanka. Below is a full report on events that groups involved with GPTC organized in different countries, complete with photos and examples of press coverage. Thanks to all who took part! A message about the International Day of Action was also sent to the following tobacco networks: CLACCTA (Latin America), Tabacozero (Brazil), Vivirsintabaco (Argentina), as well as ten radio stations in Bahia Blanca, two of which made a report. Here is a press release we distributed for the International Day of Action, as well as a letter we sent to the Central Board of Film Certification to mark the day. C-Tob held a press conference yesterday with Prof. Rahmat Awang and his deputy Mr Razak Lajis. Mr Razak is known for his activities for youth and his presence really lended a major support in the press conference. Prof. Awang explained about the International Day of Action held in line with the nearing 77th Academy Awards on February 27, 2005. He expressed his dissatisfaction that many movies had cigarette smoking scenes. He added that perhaps officers in the information department may not be aware of the impact smoking can have on viewers. In relation to that and to provide a local touch to the story, Prof. Awang said on behalf of Malaysia, C-Tob will undertake a signature campaign to the National Censorship Board and the National Film Development Corporation Malaysia (FINAS) to implement the blurring of cigarettes in all movies. This idea was mooted after Thailand's successful implementation in that direction. See press release. We also distributed a factsheet on health related to smoking. 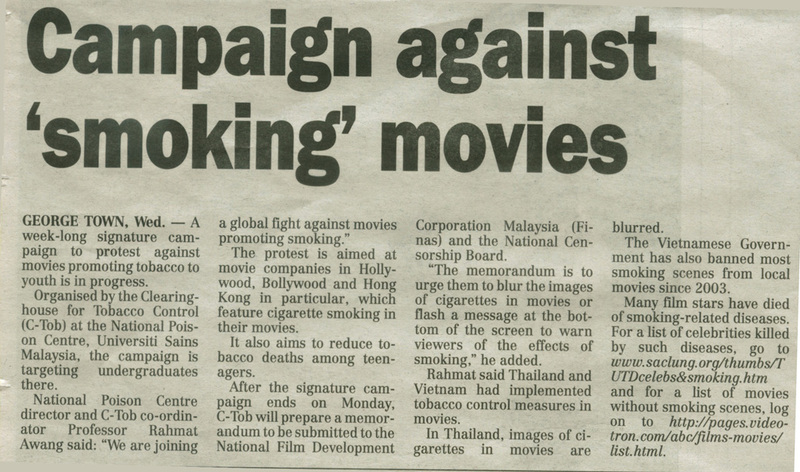 We are now carrying out a petition campaign to submit to the National Censorship Board and National Film Development Corporation Malaysia (FINAS) so that they will block all smoking scenes, be it from Hollywood, Bollywood or Chinese. Over 200 signatures have been collected so far. -- Kalei Joethi Sahadevan, Clearinghouse for Tobacco Control (C-Tob)National Poison Centre, Universiti Sains Malaysia, Penang. We at ASH New Zealand promoted the event by sending information to the press about the International Day of Action. The press release we sent was titled, "Hollywood must take more responsibility in creating healthy kiwi teens." Our director Becky Freeman did two interviews on radio (Radio New Zealand's Morning report and NIU FM). We also got coverage in the print media. View press release. 2. PRESS RELEASE: Copies of the Press Release were given to eight media houses in Ibadan, Oyo State, Nigeria, including 4 radio and television outlets, and 4 print media. 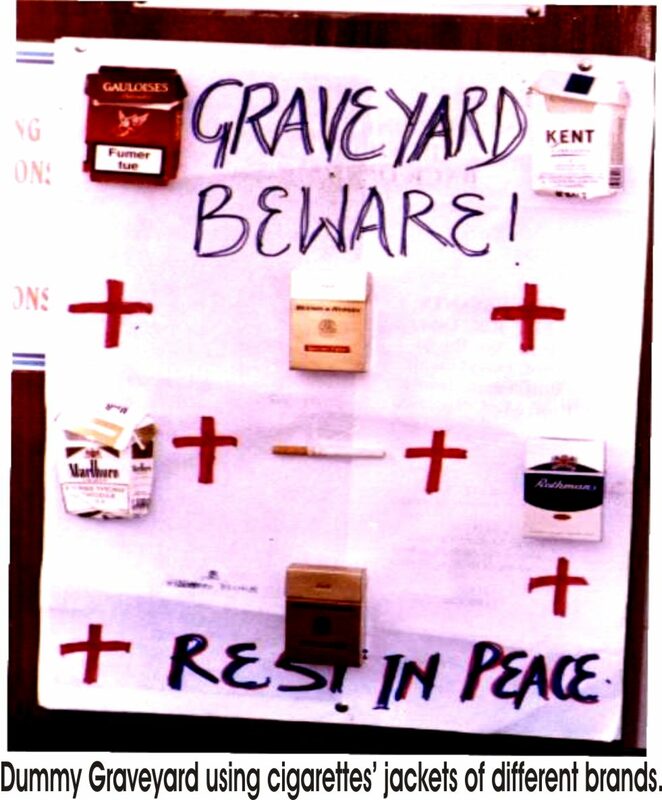 Some of the media houses challenged tobacco control advocates to organize a similar event focused on Nollywood (Nigerian version of Hollywood). Nigerian Television Authority (NTA), Ibadan and Galaxy Television Oke-Are, Ibadan read the Release as part of their news items on that day. 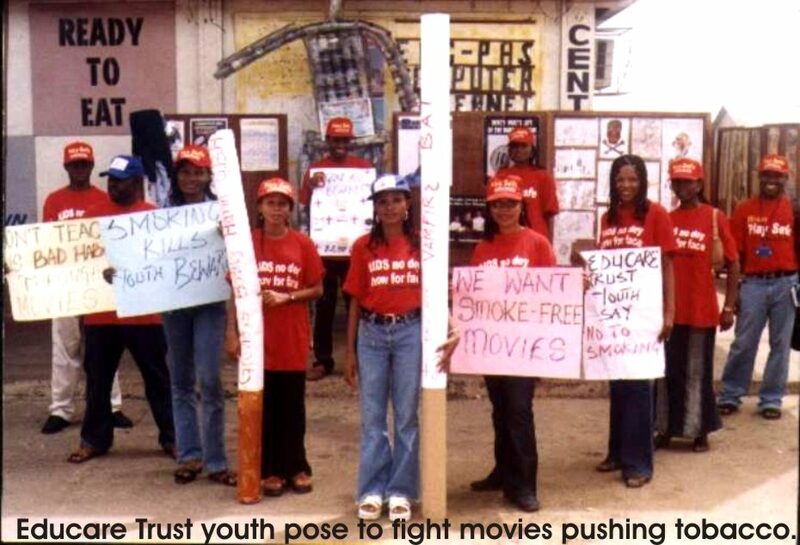 And on February 28, 2005, The Punch Newspaper published the Release (edited) under this caption: ANTI-TOBACCO CAMPAIGNERS TARGET MEDIA, MOVIE OPERATORS. On February 23, we held a screening of the movie "Die Another Day" for 200 youth at the Serigne Ameth Sy Malick school. 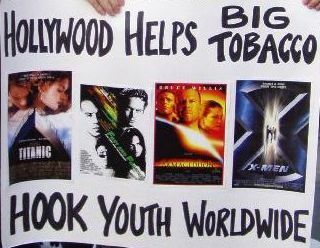 The event was used to raise awareness of smoking in Hollywood movies (the movie, which is youth-rated by the Motion Picture Association of America, has a "black lung" rating from SceneSmoking.org for 50+ smoking incidents, involving 6 different actors/actresses including star Pierce Brosnan). To get movie makers to take up the problem seriously. To stimulate a debate within Sri Lanka film industry. To encourage the removal of scenes that depict smoking in films as much as possible. Mr. Ravindra Randeniya, actor and film director said: "Even after giving up of smoking, at times I had to use cigarettes to play my roles in certain films. But now I never use it to portray even a character. 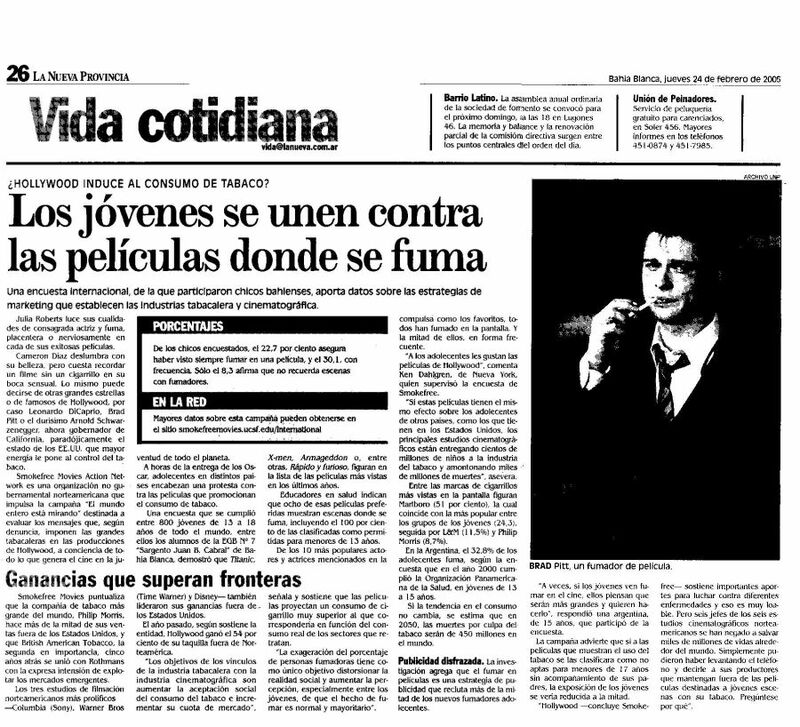 I did not know that portrayal of smoking scenes in films was a subtle strategy behind the industry=85I promise that I will never use cigarettes even in films to portray a character. Also I will give my fullest cooperation to carry out this mission." Across the U.S., Smokefree Movies Action Network members held dozens of press events and ran "The Whole World is Watching" advertisements in a variety of media, including the New York Times. In New Mexico, the New Mexico Media Literacy Project released a DVD called "Something Stinks in Hollywood"
The actions generated significant press, radio, and television coverage, including this Voice of America which mentions events in other countries. Youth hold signs "The 'F' word never gave anyone cancer" and "Why isn't smoking treated just as seriously?" Throughout the event, local high school students led a variety of chants. At the close of the event, local high school students tried to deliver a letter addressed to MPAA President Daniel Glickman and past President Jack Valenti (who still controls the rating system). They were blocked from entering the building by a man who treated them in an extremely rude manner. After a short period of negotiation, he agreed to deliver the letter for the youth. "News". Do a search for "movies dc"
In response to all the media coverage around the International Day of Action, Philip Morris USA took it upon itself to issue a press release denying that it is involved in tobacco product placement in the movies. 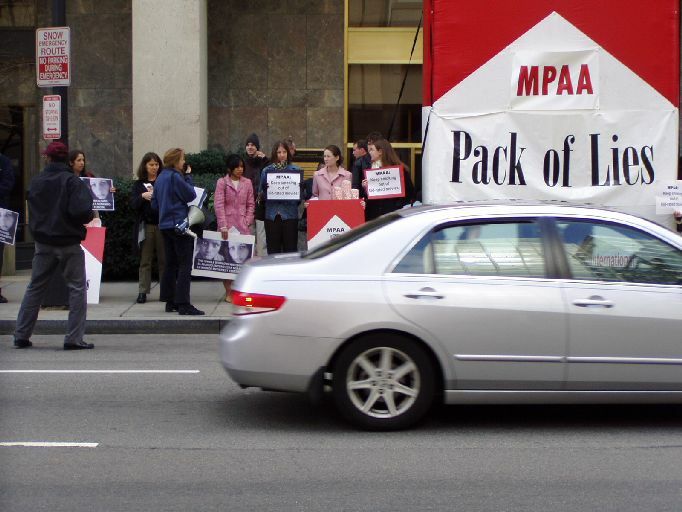 The release fails to address whether or not Philip Morris International is involved with the practice. In the informal survey of 800 youth worldwide, 51% said that they had seen Marlboro product placement in Hollywood movies. Marlboro product placement also appears to be rampant in non-Hollywood movies, such as the recent Bollywood hit "Swades."